Red, white and navy blue - sounds royal! 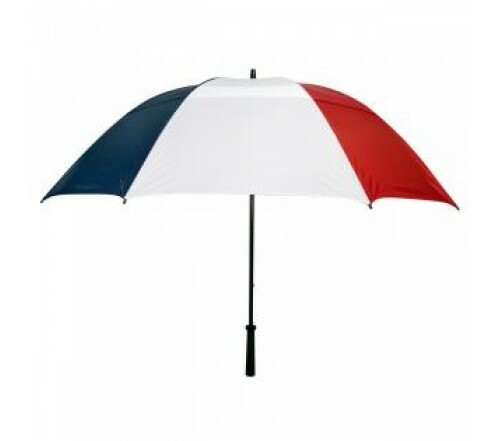 Logoed promotional red, white & navy blue 62” arc vented golf umbrellas looks royal, too! When employed for a campaign they will transform your campaigns with their royal touch. Apart from its eclectic color combination, long service life is the other thing, which lures a marketer to try it. This umbrella grabs your attention with its specialized features such as nylon and windefyer vented canopy, fiberglass and plastic handle, and shoulder strap sleeve. Custom red, white & navy 62” arc vented golf umbrellas can be sought for gifting in controlled numbers during marketing events as a complimentary gift or sales handout. Personalized red, white, & navy 62” arc vented golf umbrellas are definitely going to lead you to victory even during stormy days of business and weather! Imprint area - 10"W x 8"H. Dimensions - 62" arc - Closes to 39". 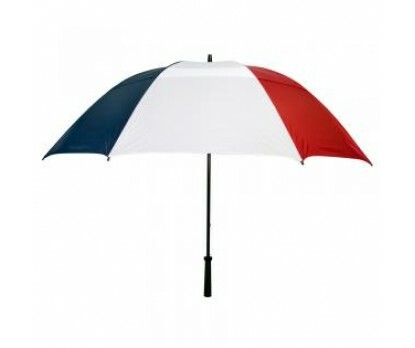 Product & Design Quality - The umbrellas are very good quality/heavy duty. They look very professional. Very happy with them! Customer Service & Shipping - Overall, very happy, but their communication could've been better. My shipment was delayed and no one let me know. They didn't even update the ship date online. But when I called about it, they were very pleasant and told me exactly when I could expect the shipment. Customer Service & Shipping - The gentleman I spoke with was great! Easy to work with!